Berkers, P., & Schaap, J. (2018). Gender inequality in metal music production. Keogh, Trish. (2017, April 7). Money, Power, and Vendor-Library Relationships: Panel Discussion with Angela Galvan, Eileen Clancy, and Nat Gustafson Sundell (Moderated by Joan Jocson-Singh). ACRL/NY Connections. Baro, Esther Merono. (2016, May 9). 5 Women in Punk and Metal who give zero f***s about their b****face. The Tempest. Kaiser, Maisie. (2016, April 25). 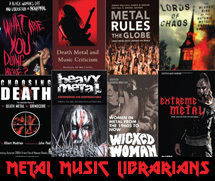 Gender, Identity, and Power in Metal Music Scenes. Thesis.